This practical aims to familiarize you with the Galaxy user interface. It will teach you how to perform basic tasks such as importing data, running tools, working with histories, creating workflows, and sharing your work. Browse to your Galaxy instance and log in or register. The Galaxy interface consists of three main parts. 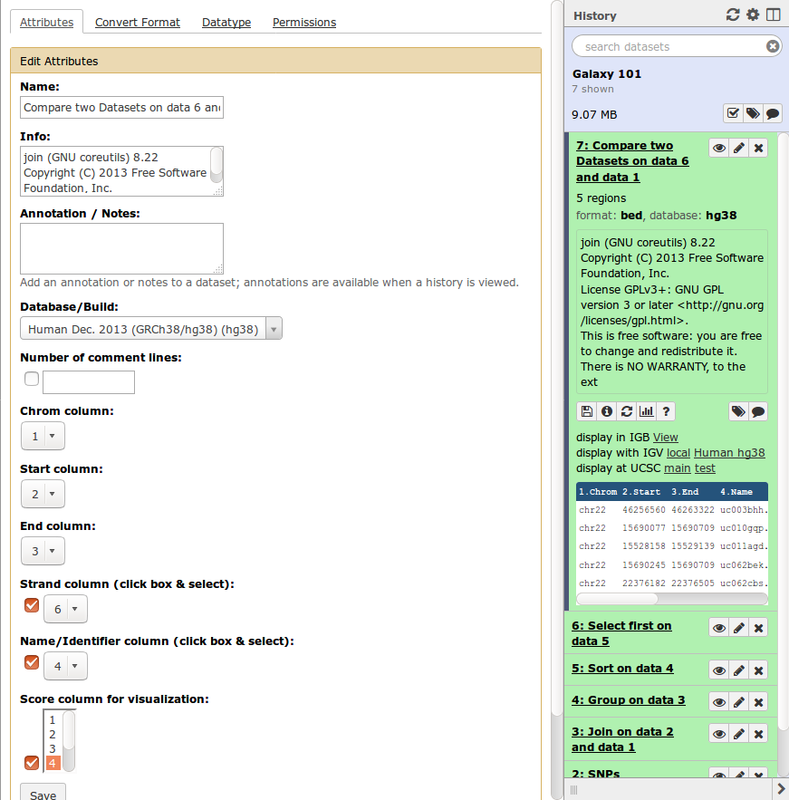 The available tools are listed on the left, your analysis history is recorded on the right, and the central panel will show the home page, a tool form or some dataset content. Make sure you start from an empty analysis history. Rename your history to be meaningful and easy to find. 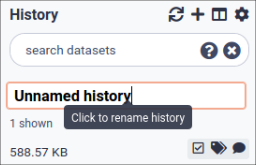 You can do this by clicking on the title of the history (which by default is Unnamed history) and typing Galaxy 101 as the name. Do not forget to hit the enter key on your keyboard to save it. We are now ready to perform our analysis, but first we need to get some data into our history. You can upload files from your computer, but Galaxy can also fetch data directly from external sources. 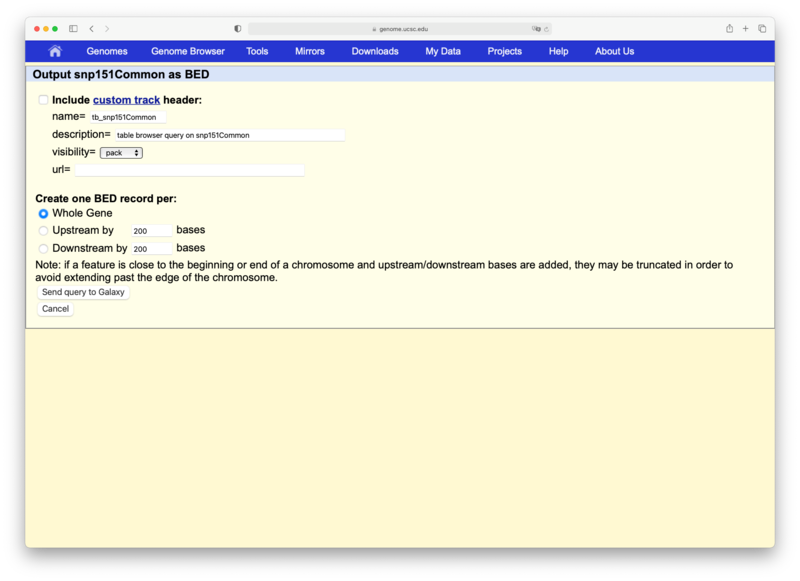 We will now import a list of all the exon locations on chromosome 22 directly from the UCSC table browser. Change Create one BED record per to Coding Exons and then click on the Send query to Galaxy button. Each line represents an exon, the first three columns are the genomic location, and the fourth column contains the name of the exon. Let’s rename our dataset to something more recognizable. The “track” setting shows the version of the SNP database to get. In this example it is version 150, but you may select the latest one. Your results may vary slightly from the ones in this tutorial when you select a different version, but in general it is a good idea to select the latest version, as this will contain the most up-to-date SNP information. Make sure that “Create one BED record per” is set to Whole Gene (Whole Gene here really means Whole Feature), and click on Send query to Galaxy. You will get your second item in your analysis history. Now rename your new dataset to SNPs so we can easily remember what the file contains. Let’s remind ourselves that our objective is to find which exon contains the most SNPs. Therefore we have to join the file with the exon locations with the file containing the SNP locations (here “join” is just a fancy word for printing the SNPs and exons that overlap side-by-side). Different Galaxy servers may have tools available under different sections, therefore it is often useful to use the search bar at the top of the tool panel to find your tool. Note: if you scroll down on this page, you will find the help of the tool. Let’s take a look at this dataset. The first six columns correspond to the exons, and the last six columns correspond to the SNPs. Column 4 contains the exon IDs, and column 10 contains the SNP IDs. In our screenshot you see that the first lines in the file all have the same exon ID but different SNP IDs, meaning these lines represent different SNPs that all overlap the same exon. Therefore we can find the total number of SNPs in an exon simply by counting the number of lines that have the same exon ID in the fourth column. For the first 3 exons in your file, what is the number of SNPs that fall into that exon? We’ve just seen how to count the number of SNPs in each exon, so let’s do this for all the exons in our file. This file contains only two columns. The first contains the exon IDs, and the second the number of times that exon ID appeared in the file - in other words, how many SNPs were present in that exon. How many exons are there in total in your file? Each line now represents a different exon, so you can see the answer to this when you expand the history item, as in the image below. The exact number you see for your dataset may be slightly different due to the updates to the exon and SNPs information. Now we have a list of all exons and the number of SNPs they contain, but we would like to know which exon has the highest number of SNPs. We can do this by sorting the file on the second column. Set the “on column” parameter to Column: 2, by default it will select a numerical sort in descending order, which is exactly what we want in this case. Click Execute and examine the output file. You should now see the same file as we had before, but the exons with the highest number of SNPs are now on top. Which exon has the highest number of SNPs in your file? Keep in mind this may depend on your settings when getting the data from UCSC. Let’s say we want a list with just the top-5 exons with highest number of SNPs. Click Execute and examine the output file, this should contain only the first 5 lines of the previous dataset. Congratulations! You have now determined which exons on chromosome 22 have the highest number of SNPs, but what else can we learn about them? 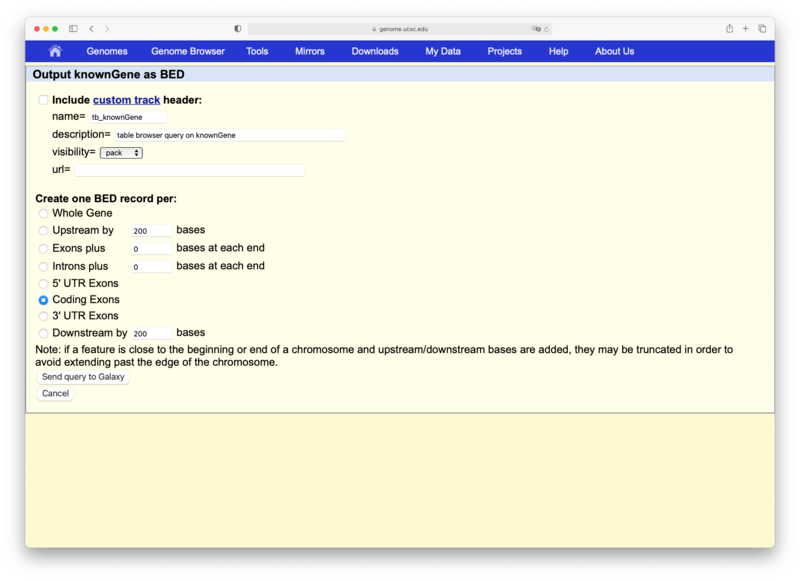 One way to learn more about a genetic location is to view it in a genome browser. However, in the process of getting our answer, we have lost information about the location of these exons on the chromosome. But fear not, Galaxy saves all of your data, so we can recover this information quite easily. Set the parameters to compare the column 4 of the exon file with column 1 of the top-5 exons file to find matching rows of the first dataset. A good way to learn about these exons is to look at their genomic surrounding. This can be done by using genome browsers. Galaxy can launch a genome browser such as IGV on your local machine, and it can connect to online genome browsers as well. 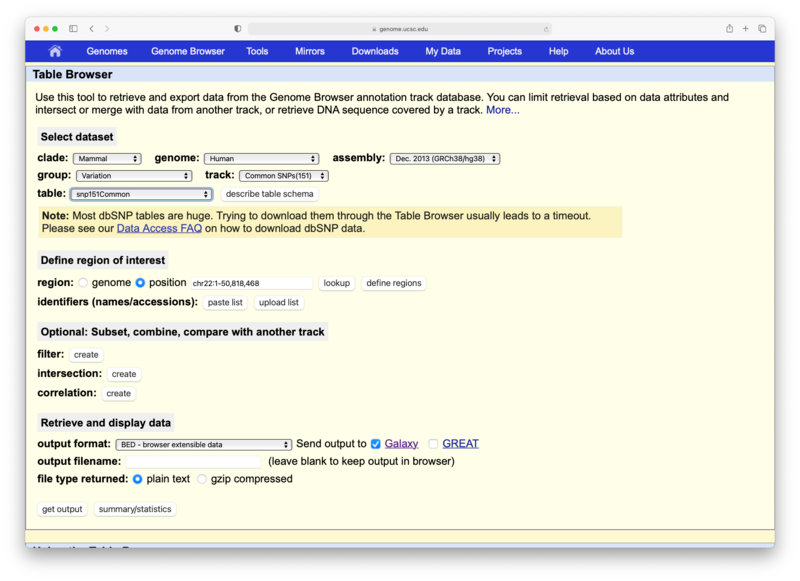 An example of such an online genome browser is the UCSC genome browser. First, check that the database of your latest history dataset is hg38. If not, click on the galaxy-pencil pencil icon and modify the Database/Build: field to Human Dec. 2013 (GRCh38/hg38) (hg38). 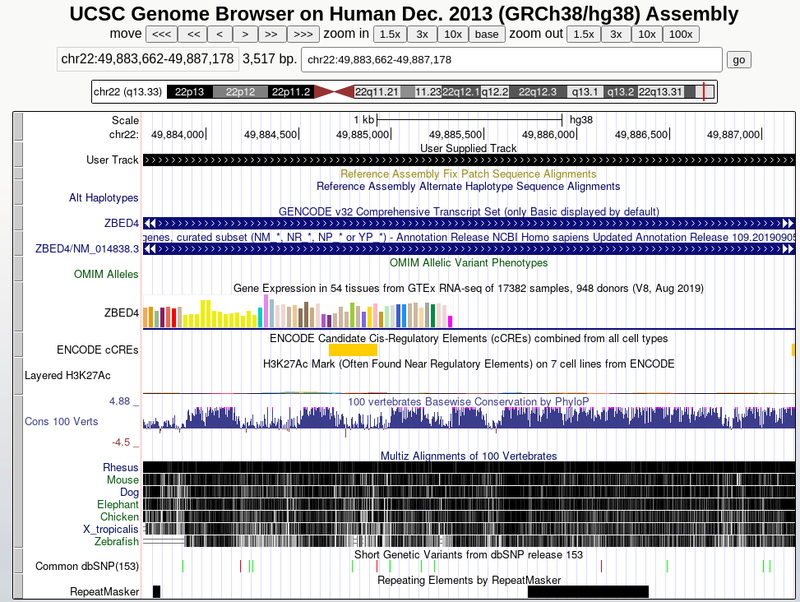 To visualize the data in UCSC genome browser, click on display at UCSC main option visible when you expand the history item. This will upload the data to UCSC as custom track. To see your data look at the User Track near the top. You can enter the coordinates of one of your exons at the top to jump to that location. 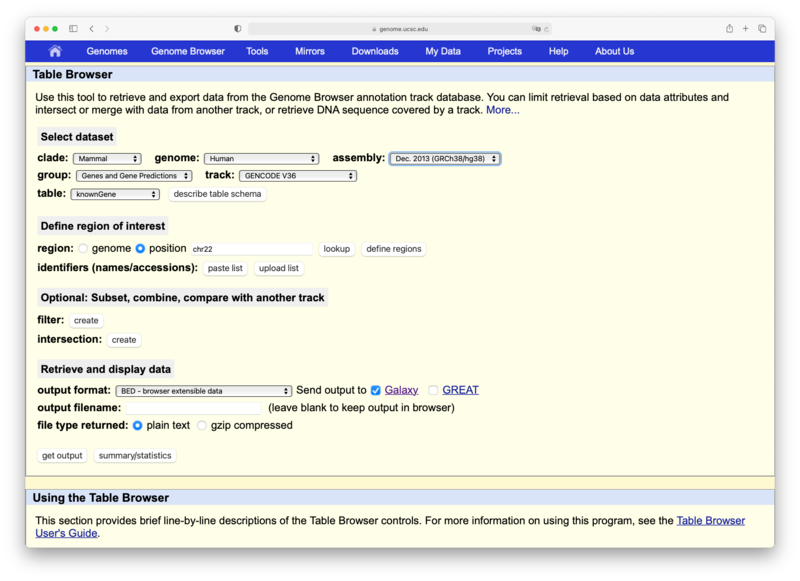 UCSC provides a large number of tracks that can help you get a sense of your genomic area, it contains common SNPs, repeats, genes, and much more (scroll down to find all possible tracks). An alternative overview of your histories can be accessed by clicking on the View all histories button at top of your history panel (window icon). Here you see a more detailed view of each history, and can perform the same operations, such as switching to a different history, deleting a history, purging it (permanently deleting it, this action cannot be reversed), or copying datasets and even entire histories. You can always return to your analysis view by clicking on Analyze Data in the top menu bar. When you look carefully at your history, you can see that it contains all steps of our analysis, from the beginning to the end. 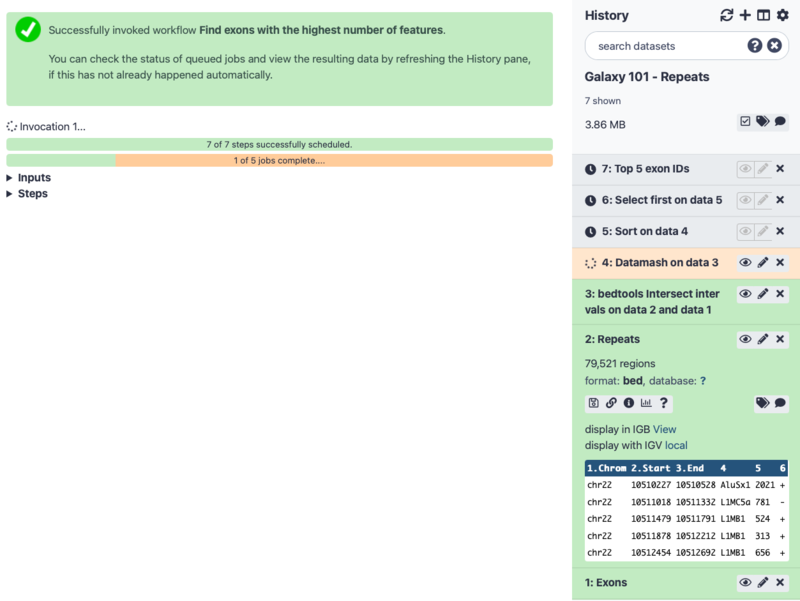 By building this history we have actually built a complete record of our analysis with Galaxy preserving all parameter settings applied at every step. Wouldn’t it be nice to just convert this history into a workflow that we’ll be able to execute again and again? Galaxy makes this very easy with the Extract workflow option. This means any time you want to build a workflow, you can just perform it manually once, and then convert it to a workflow, so that next time it will be a lot less work to do the same analysis. Clean up your history. If you had any failed jobs (red), please remove those datasets from your history by clicking on the x button. This will make the creation of a workflow easier. 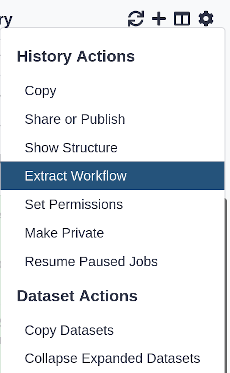 Go to the history Options menu (gear symbol) and select the Extract Workflow option. 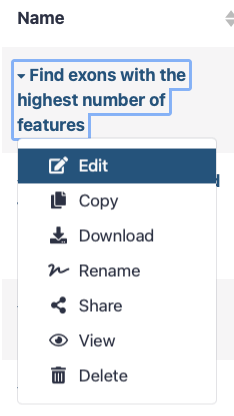 The central panel will change as shown below and you will be able to choose which steps to include/exclude and how to name the newly created workflow. 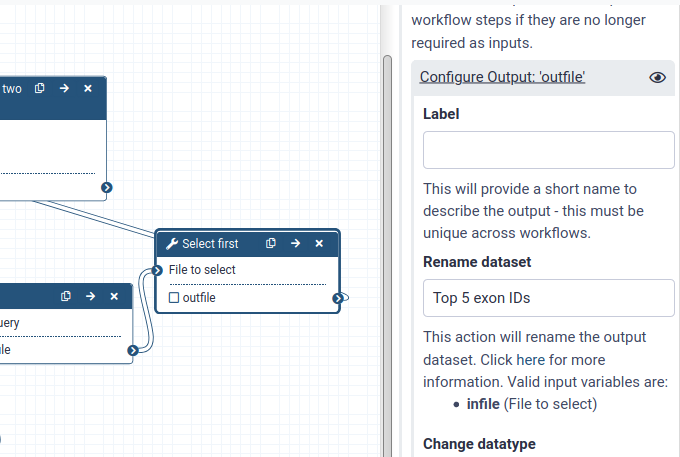 Uncheck any steps that shouldn’t be included in the workflow (if any), and rename the workflow to something descriptive, for example Find exons with the highest number of SNPs. Click on the Create Workflow button near the top. You will get a message that the workflow was created. But where did it go? 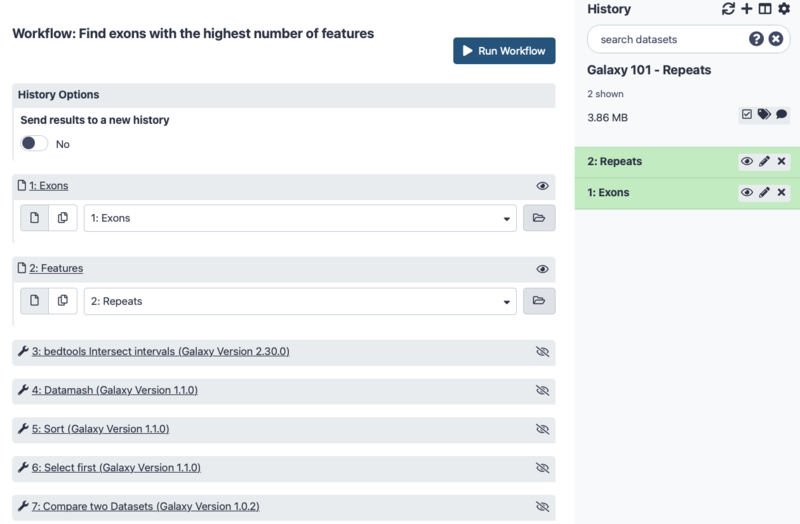 We can examine the workflow in Galaxy’s workflow editor. Here you can view/change the parameter settings of each step, add and remove tools, and connect an output from one tool to the input of another, all in an easy and graphical manner. 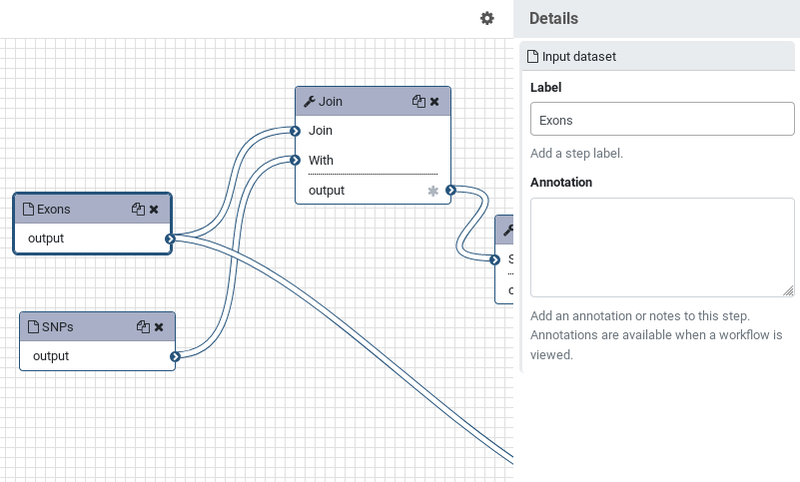 You can also use this editor to build workflows from scratch. Click on the triangle to the right of your workflow name. When you click on a component, you will get a view of all the parameter settings for that tool on the right-hand side of your screen. Click the asterisk next to out_file1 in the Select First and Compare two Datasets tools. Now, when we run the workflow, we will only see the final two outputs, i.e. the table with the top-5 exons and their SNP counts, and the file with exons ready for viewing in a genome browser. Once you have done this, you will notice that the minimap at the bottom-right corner of your screen will have a colour-coded view of your workflow, with orange boxes representing a tool with an output that will be shown. If you didn’t specify a name for the input datasets at the beginning, they will be labeled Input Dataset. In this case you can change the labels now to avoid confusion when using the workflow later on. 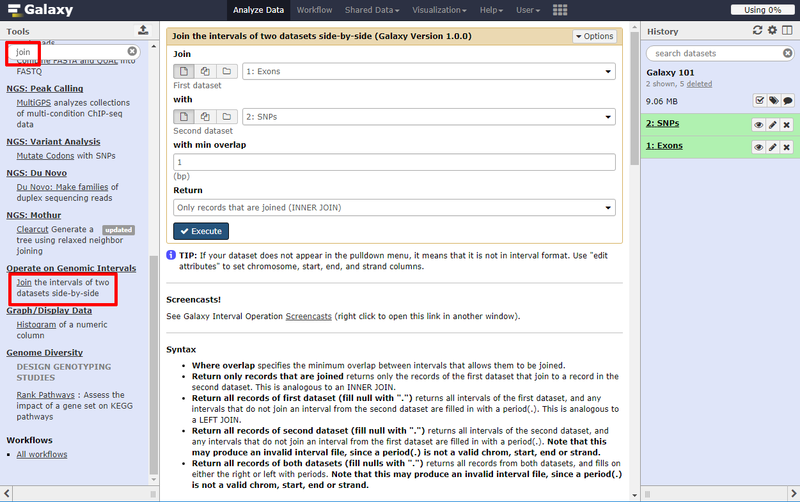 In the image above, you see that the top input dataset (with the blue border) connects to the first input of the Join tool, so this corresponds to the exon data. Click on the box corresponding to the exon input dataset, and change the Label to Exons on the right-hand side of your screen. Repeat this process for the other input dataset. Name it Features. We used it to calculate highest number of SNPs, but this workflow would also work with other features, so we give it a bit more generic name. Let’s also rename the outputs. 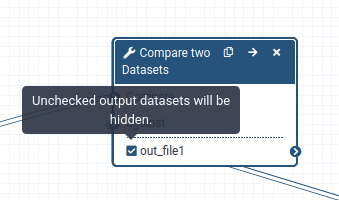 Click on the Select first tool and in the menu on the right click on Configure Output: 'out_file1' and enter a descriptive name for the output dataset in the Rename dataset box. Repeat this for the output of the Compare two Datasets tool. Save your workflow (important!) by clicking on the gear icon at the top right of the screen, and selecting Save. Return to the analysis view by clicking on Analyze Data at the top menu bar. 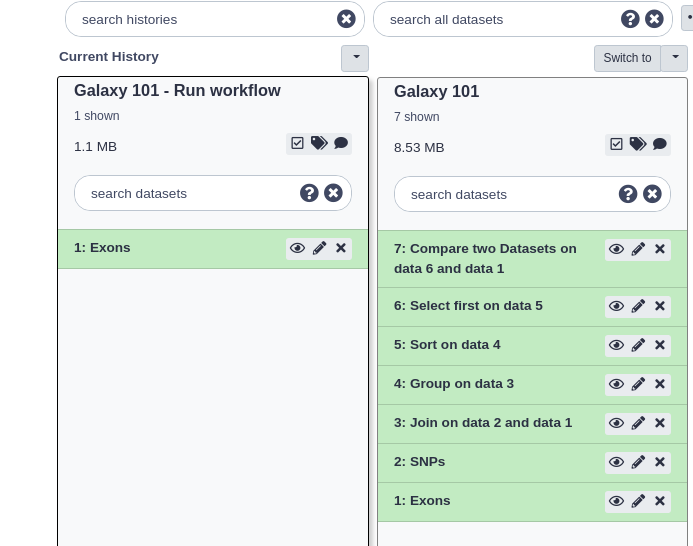 We could validate our newly built workflow by running it on the same input datasets than the ones in the Galaxy 101 history used to extract the workflow in order to make sure we do obtain the same results. Now that we have built our workflow, let’s use it on some different data. For example, let’s find out which exons have the highest number of repeat elements. Create a new history (gear icon) and give it a name. We will need the list of exons again. We don’t have to get this from UCSC again, we can just copy it from our previous history. The easiest way to do this is to go to the history overview (window icon at top of history panel). Here you can just drag and drop datasets from one history to another. We wanted to know something about the repetitive elements per exon. We get this data from UCSC. Click on get output and then Send query to Galaxy on the next screen. Open the workflow menu (top menu bar). Find the workflow you made in the previous section, and select the option Run. 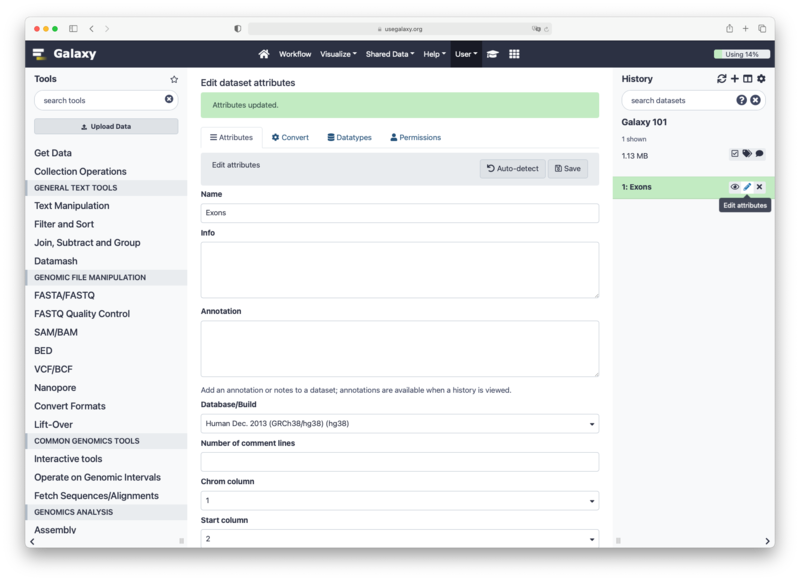 The central panel will change to allow you to configure and launch the workflow. 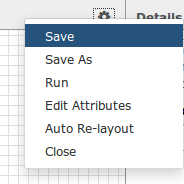 Select appropriate datasets for the inputs as shown below, then scroll down and click Run workflow. 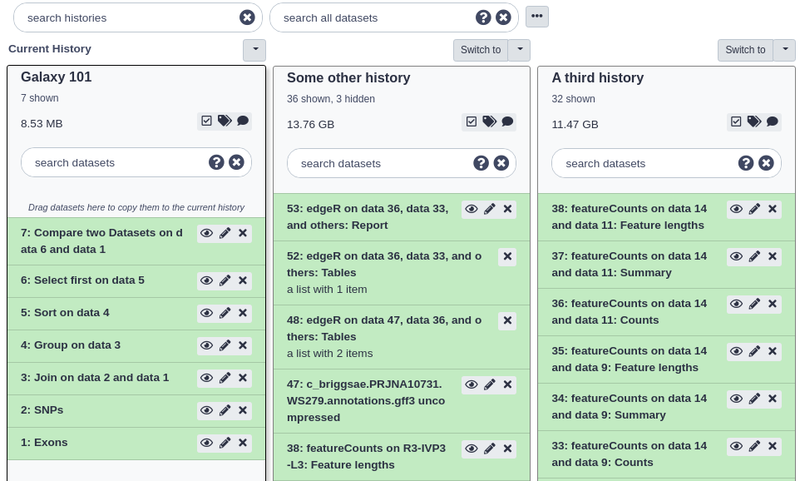 Because most intermediate steps of the workflow were hidden, once it is finished you will only see the final two datasets. 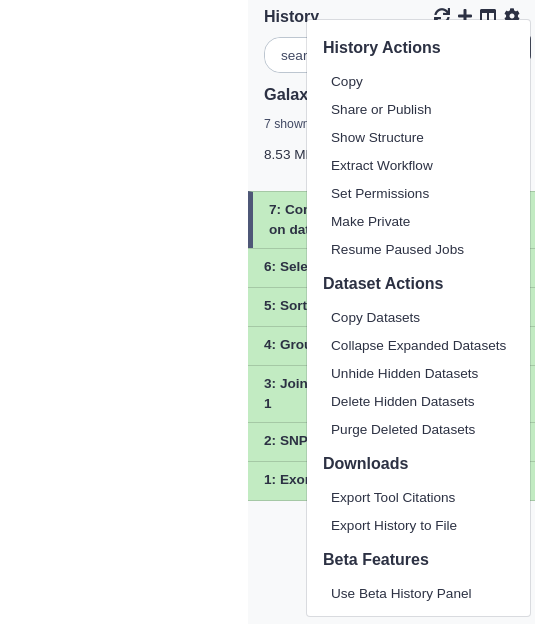 If we want to view the intermediate files after all, we can unhide all hidden datasets by selecting Unhide Hidden Datasets from the history options menu. Which exon had the highest number of repeats? How many repeats were there? One of the most important features of Galaxy comes at the end of an analysis. When you have published striking findings, it is important that other researchers are able to reproduce your in-silico experiment. 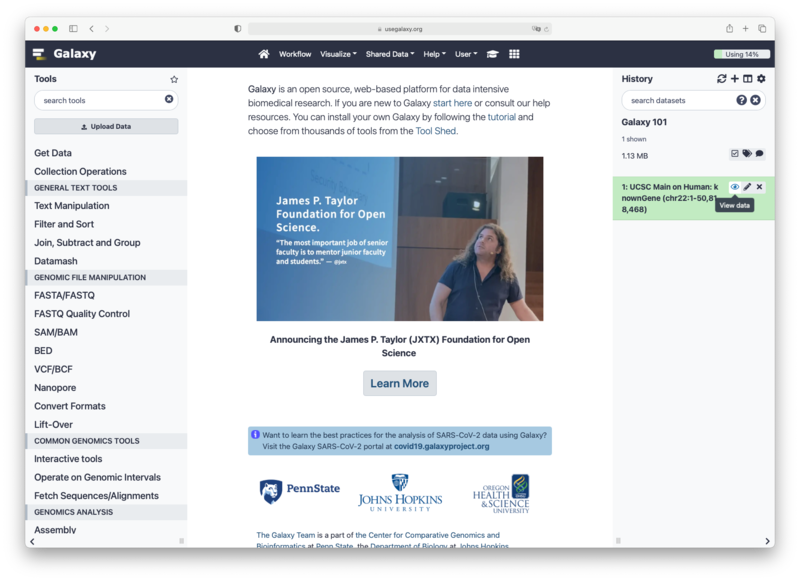 Galaxy enables users to easily share their workflows and histories with others. Make History Accessible via Link. This generates a link that you can give out to others. Anybody with this link will be able to view your history. Make History Accessible and Publish. This will not only create a link, but will also publish your history. This means your history will be listed under Shared Data → Histories in the top menu. Share with a user. This will share the history only with specific users on the Galaxy instance. Share one of your histories with your neighbour. See if you can do the same with your workflow! Find the history and/or workflow shared by your neighbour. Histories shared with specific users can be accessed by those users in their history menu (gear icon) under Histories shared with me. trophy Well done! You have just performed your first analysis in Galaxy. 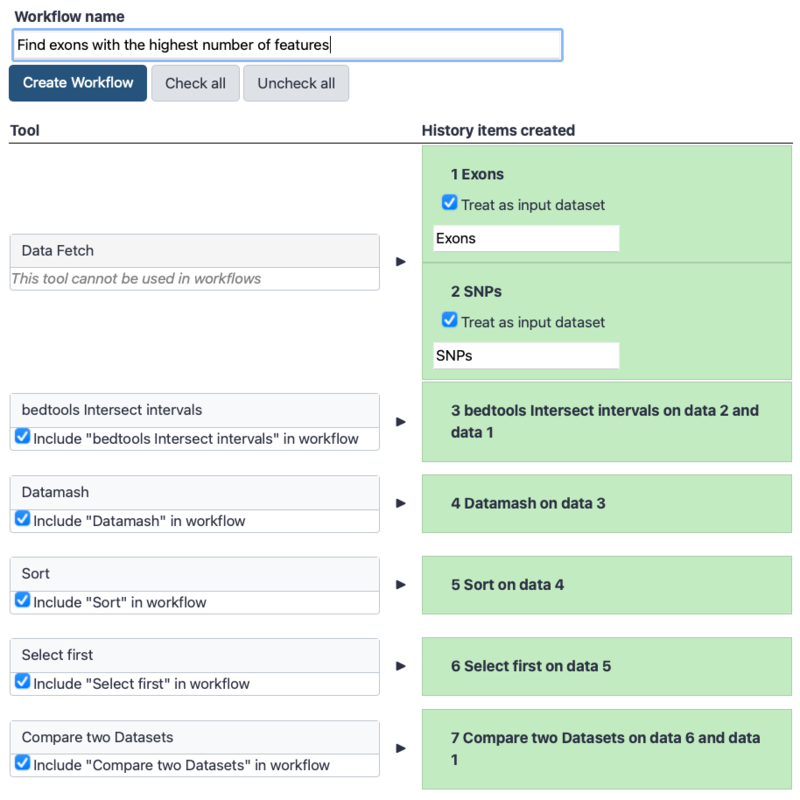 You also created a workflow from your analysis so you can easily repeat the exact same analysis on other datasets. Additionally you shared your results and methods with others. This material is the result of a collaborative work. Thanks to the Galaxy Training Network and all the contributors ( Saskia Hiltemann, Nicola Soranzo, Clemens Blank, Anton Nekrutenko, Björn Grüning, Anne Pajon)!